Use goals to keep track of your progress on achieving target revenue. Select the site map icon , and then select Goals. Name. Type a name that describes the goal. Parent Goal. If this goal is a child goal of another goal, select that goal as a parent goal here. Goal Metric. Choose how the goal will be tracked by selecting a metric for the goal. If you select a parent goal for this goal, you can't select a goal metric. It is automatically populated from the parent goal. Goal Owner. Select the user or team responsible for meeting the goal. On the Time Period tab, specify whether the goal period is a fiscal period or a custom period. If Goal Period Type is Fiscal Period, select a fiscal period and fiscal year for which the goal is tracked. 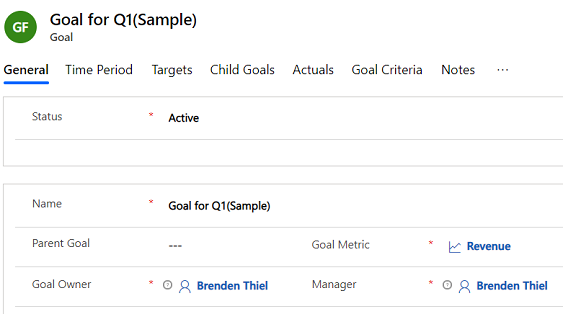 If Goal Period Type is Custom Period, select a date in the From and To fields to define a custom period for which the goal is tracked. If this goal has a parent goal, you can't specify the time period for the goal. It is automatically populated from the parent goal. Target (Decimal). Required. This field is available if the goal Metric Type is Amount and the Amount Data Type is Decimal. Target (Money). Required. This field is available if the goal Metric Type is Amount and the Amount Data Type is Money. Target (Integer). Required. This field is available if the goal Metric Type is Amount and the Amount Data Type is Integer or if the goal Metric Type is Count. Stretched Target (Decimal). Required. This field is available if the goal Metric Type is Amount and the Amount Data Type is Decimal. Stretched Target (Money). Required. This field is available if the goal Metric Type is Amount and the Amount Data Type is Money. Stretched Target (Integer). Required. This field is available if the goal Metric Type is Amount and the Amount Data Type is Integer or if the goal Metric Type is Count. To add an existing goal as a child goal of this goal, on the Child Goals tab, select the Add Existing Goal button. Actual (Money). If the goal metric uses Money as the Amount Data Type, this field shows the total amount of money achieved towards the goal as of the last rolled-up date. In-progress (Money). If the goal metric uses Money as the Amount Data Type, this field shows the amount of money achieved towards the goal since the last time the actuals were calculated. Percentage Achieved. If the goal metric is Decimal or Integer, this field shows the percentage of the goal that is complete as of the last rolled-up date. Last Rolled Up Date. This field shows the last date and time that the actuals were recalculated. On the Goal Criteria tab, define the criteria that will be used for rolling up the Actuals data against the goal. Roll Up Only From Child Goals. If you want to limit the data used for the roll up to only child goals, select Yes. To allow other data to be used for the roll ups, select No. Record Set for Rollup. If you want to limit the records that can be included in the roll up to only those records owned by the goal owner, select Owned by goal owner. To allow all records to be included in the roll up data, select All. On the Notes tab, enter any notes for this goal. If you are using the Sales app, select New. On the New Goal form, enter information or observe any noted restrictions or requirements as needed. Use the handy tooltips as a guide. Select or tap Save or Save & Close.